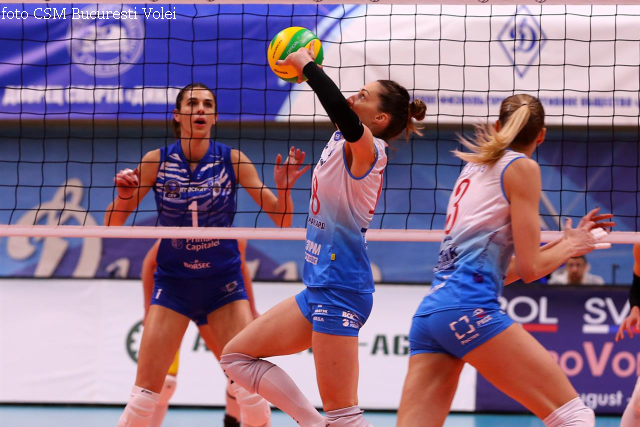 Romanian women's volley team CSM Bucharest on Wednesday sustained a 3-1 away defeat by Russian opponents Dinamo Moscow. The match counted towards Champions League's Group E. For CSM Bucharest, it was the third defeat in a row in the League's group stage, despite an auspicious debut in the Champions league, with a win away from home. CSM's top scorer was Ukrainian Iryna Trushkina, with 17 points. In the other Group E match, Fenerbahce Istanbul outclassed Polish challengers Chemik Police, 3-nil, away from home, on February 20th. Fenerbahce are now ranking first in their group. CSM Bucharest's next fixture is the home game against Chemik Police, away from home. In the European Volleyball Confederation Cup, in the first leg of the quarterfinals' tie, CSM Volei Alba Blaj sustained a nil-3 defeat at the hands of Galatasaray Istanbul, away from home. European vice-champions conceded defeat after only 69 minutes of play, when they only had the lead six times, three times in the first set and three times in the second set. CSM Alba Blaj's Serbian player Nadia Ninković was the top scorer, with 14 points. The return leg against the Turkish team is scheduled for February 12, in Sibiu, central Romania. In the LEN Champions League, in Group A, the water polo team Steaua Bucharest sustained a 10-14 home defeat by Spanish opponents Barceloneta. The first three quarters saw the guests dominating the game, then Romanian champions Steaua braced up and won the last quarter, 5-2, which was not enough to turn the tables for the entire game. In Group A's other match, the Hungarian team Eger outclassed Red Star Belgrade, 17-11. Italian team Pro Recco are at the top of the table in Group A. Steaua Bucharest is 7th-placed, the last but one position in the group. Steaua's next fixture is a home confrontation against Dinamo Moscow, on February 27.